Venice arrival, walk narrow lanes, art galleries, shop windows, view from top of Campanile, Bell Tower, Gorbachev in the Piazza San Marco, pizza at Campo S Maria Formosa. Venice transfer to hotel. 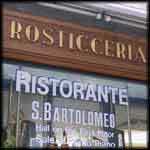 Lunch near Rialto Market at the Rosticceria, musical visit inside Basilica San Marco, Frari, walk lanes to Fiascheterria Toscana for delicious dinner. 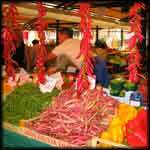 Venice Rialto market, walk lanes to Frari, more walking. Venice arrival, baggage barge, vaporetto down Grand Canal, gondola ride, dinner at Fiaschetteria Toscana, Roberto's outstanding wine service. 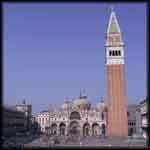 Venice gondola ride, Rialto market, street markets, walking little lanes, Piazza San Marco, vaporetto to station, departing comments. Venice Daniela walking tour, discussing wells, at Snail Staircase, Grand Canal, traghettos, osteria, S Giovani e Paolo, Doge's Palace, Bridge of Sighs. 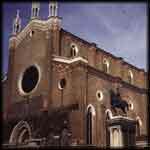 Venice SS Giovanni e Paolo, detailed look at this major Gothic church in Venice with our guide Daniella Cominotto. 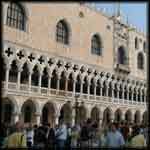 Venice Daniella walking tour to Scuola di San Marco, walking in nearby lanes, lunch at Campo Santa Maria Formosa, watch boat traffic in narrow canals, then to Piazaa San Marco. Venice Daniela Walk to the Church of Miracoli, then on to the waterfront by Piazetta, San Giovani e Paolo, Campo Santa Maria Formosa, dinner. 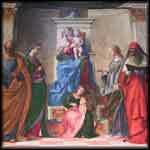 Venice Daniela's tour fills us in on the history, then we visit SS Giovannii e Paolo, Piazza San Marco and San Zaccaria, to admire the great painting by Bellini. Venice Daniella Cominotto takes us inside the Basilica, outside the Doge's Palace, view the gondolas and end up at the glass factory of Vechia Murano. Vecchia Murano. 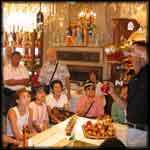 Venice Glass blowing demonstration and sales presentation at Vecchia Murano, near Piazza San Marco. 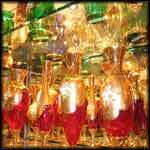 Vecchia Murano Venice glass demonstration. 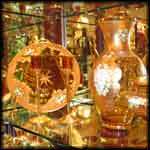 This factory shop is located just behind the Basilica San Marco and has some of the best glass in town. Venice gondola Gondola ride through center of Venice in the little canals. 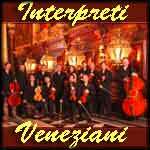 Venice gondola music. 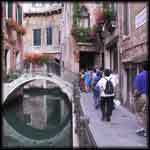 We take you on yet another musical journey through the little canals of Venice. 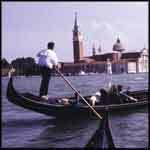 Venice Musical gondola ride. 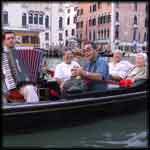 You could enjoy a gondola ride without music, but this special experience is even better when a great singer performs. Gondola travel video ride with music, part 3 featuring a local singer. Relax as the scenery glides by. 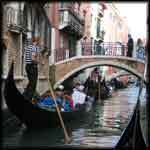 Gondola ride with music -- once again we take you on another journey through the little canals. Each one of these travel videos is different. singers, scenery. 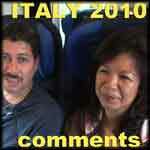 Comments 2010: We talk about highlights of our visit to Italy, looking back at Rome, Florence and Venice. 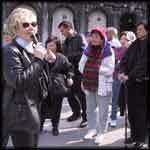 Comments from travelers about the highlights of Italy, including Rome, Florence and Venice. 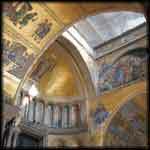 Venice Biennale art exhibit, best of 2005, 2009, 2011. Venice Biennale is a major contemporary art exhibition that takes place once every two years (in odd years) in Venice, Italy. 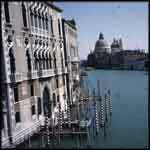 We have created three movies about the various past Biennales, filled with amazingly entertaining art in all media. 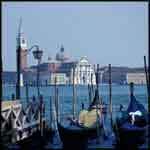 Venice Biennale art exhibit 2003 It is like a World’s Fair of Art, or an amusement park filled with beautiful treasures. Nearly 400 artists representing over 80 countries create new works especially for this show, which is the world’s oldest, largest and best Biennial art exhibit. 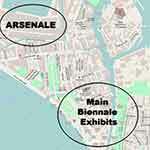 Venice Biennale art exhibit 2013. This movie about the 2013 exhibit features: Belgium, Netherlands, Hungary, Greece, France, Korea, Japan, Russia, Venezuela, Switzerland, Indonesia, Italy, the main Pavilion, extensive look at many artists in the Arsenale. 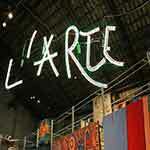 Venice Biennale art exhibit YouTube Playlist. Look for our various movies about earlier years. Featuring: Denmark, Russia, Japan, UK, France, Czech, Australia, Uruguay, Greece, USA, Iceland, Hungary, Netherlands, and many more in the main Pavilion, including Damien Hirst.